Why is Arum talking Pacquiao vs. Marquez 5? By Robert “Big Moe” Elmore: On September 2nd of this year, Top Rank CEO Bob Arum told The Independent (a UK based newspaper) that Manny Pacquiao could fight Floyd Mayweather Jr twice in 2015. In that same article he claimed it “appeared” that Showtime and HBO wanted to the do the fight. In the same month on the 11th, Arum said he was contacted by both networks and was told how they would jointly handle the fight (as told to another UK newspaper Telegraph Many fans geared up somewhat with excitement, but I remained calm to wait for more information. My patients prevailed as Arum then told Dan Rafael that Marquez could potentially fight Tim Bradley or Manny Pacquiao in April of 2015. That news came on October 4th of this year. Marquez has stuck to his guns thus far about not wanting to do a fifth fight. And then the big ka boom came as Top Rank announced that Bradley would be fighting Diego Chavez on December 15th of this year. All this agreeing from the networks, but we have heard nothing from HBO sports President Ken Hershman or Showtime executive Steve Espinoza. Now there may or may not be truth to Arums claims about the networks being on the same page. I would prefer to hear something from the presidents confirming these claims. They might have come to an agreement and are waiting on Floyd and Manny to come to terms. 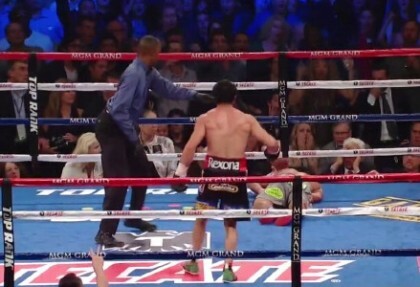 But what is mind-boggling is that Arum threw Pacquiao’s name in the mix to fight Marquez. We know Bradley is not a consideration because that would be four month turn around coming off his fight with Chavez. That leaves no room to rest or properly train. That would be a miracle if Bradley was able to pull off that feat. So that leaves Pacquiao. Why would Arum release such information about the networks being in agreement about distributing the mega fight, then say the two stars are trying to fight twice next year, but then throw Pacquiao’s name in the mix as a potential opponent for Marquez? « Will Hopkins make it ugly against Kovalev? Boxing » Juan Manuel Marquez » Why is Arum talking Pacquiao vs. Marquez 5?